On October 26, 2014, the commemoration day of the Holy Fathers of the Seventh Ecumenical Council, Metropolitan Hilarion of Volokolamsk, head of the Moscow Patriarchate department for external church relations, celebrated the Divine Liturgy at the church of Our Lady the Joy to All the Afflicted-in-Bolshaya-Ordynka, Moscow. 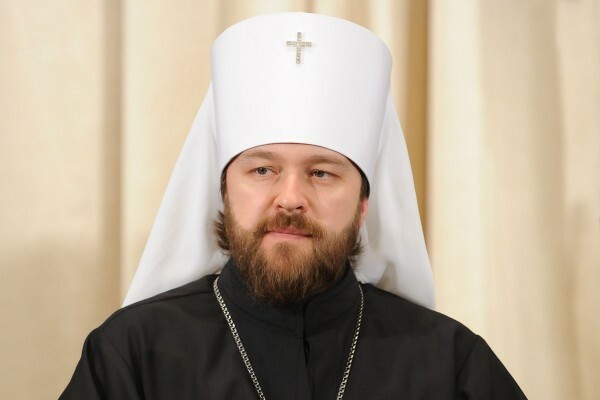 After the Litany of Fervent Supplication, Metropolitan Hilarion lifted up a prayer for peace in Ukraine. After the service, he addressed the congregation with an archpastoral homily, speaking about numerous saints “whose hearts proved to be a good soil as the word of God sown in it brought forth fruit thirty and a hundredfold”. Our Russian land, he said, has become a rich soil in which the seeds sown by the Divine Sowers have produced rich fruit. “Even in the recent time when severe persecutions fell upon our holy Church, hundreds and thousands of people – bishops, priests, monks, nuns – brought forth this fruit a hundredfold. When the persecutors forced them to renounce God and the Church they proved to be steadfast in face of the severest trials, pressure and torture. No physical suffering or physical pain could make Christians give up their love of Christ, which overcomes every suffering, every human intention and every human pain”. “There is not enough time or words to enumerate all the saints produced by the Russian land and the feats they performed. We can only testify to one thing: our land has become a good soil as many human hearts have responded to the Divine Word and in many people it has brought forth good fruit a hundredfold… Let us turn to these saints who did not just read the Gospel but responded to it with all their heart, all their life to show us today their eternal example of virtuous Christian life. Let us emulate their Christian life and their feats as much as we can”, he concluded.